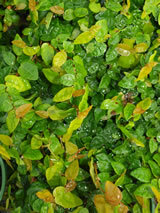 Small creeping vine that has self-rooting stems that will cling to walls and trunks of trees in its juvenile stage. As a juvenile it has soft heart shaped dark green leaves. 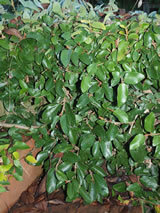 As it matures the plant develops thick stocky branches in its adult stage, with longer leathery mid-green leaves. 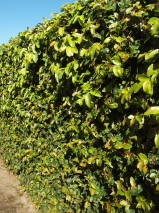 Very useful for densely covering walls, fences or buildings. Hardy, though prefers semi-shaded sites. Self-clinging, aerial roots or adhesive. We have this currently available in a POT 2.5 & POT 4 containers. Ask for them at your retailer.